ALVIN, TX (KTRK) -- When students at Alvin Junior High School heard their beloved choir teacher was in hospice, they wanted to do more than just send her their thoughts and prayers. They decided they wanted to let Mrs. Mariana Walker know in person how much she meant to them using a tool she always loved - their voices. More than a dozen students went Walker's home after school on Wednesday and sang Hillsong's "Oceans." Cindi Lee Cooper - Fields recorded the heartwarming moment. "(Her family) opened the doors so she could hear them sing," said Cooper - Fields. "It was one of the most beautiful gestures I have ever seen. Friends from all ages got together and sang like angels in hopes of her feeling our love and respect we all have for her." Once the students were done singing, they said a prayer and their final goodbyes. "The family walked back in the house and within a few minutes she took her last breath," said Cooper - Fields. Walker died just moments after the song. "Knowing Mrs.Walker you knew she wasn't going to leave us until the show was over," said Cooper - Fields. Funeral services for Walker are scheduled for Monday. Ben Ellis was fighting an aggressive form of cancer. 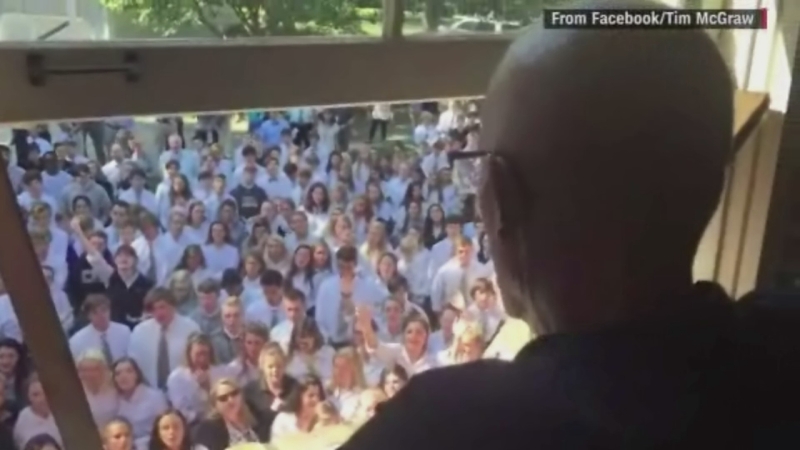 The Christ Presbyterian Academy in Nashville, Tennessee, where he worked told ABC News that Ellis died early Friday morning.